What is the relationship between photocurrent vs frequency? I'm very confused, as there are conflicting sources: Why doesn't photoelectric current increase with frequency of the incident wave? This states that frequency does not affect current because it does not eject more electrons, it only affects the initial kinetic energy of the electrons, which make sense. In the default setting, since the intensity of light is proportional to the number of photons times the frequency, if you increase the frequency while holding the intensity constant, the number of photons will decrease. Therefore, if you increase the frequency past the point where all photons are emitting electrons (see previous bullet), the number of emitted electrons (and therefore the current) will start to decrease. Note that this is different from the simplified model used by many textbooks, in which current is constant above the threshold frequency. If you want to be able to change the frequency without changing the number of photons, select “Control photon number instead of intensity” in the Options menu. Not the answer you're looking for? Browse other questions tagged quantum-mechanics photoelectric-effect or ask your own question. Why doesn't photoelectric current increase with frequency of the incident wave? What is the relation between photoelectric current and frequency of incident light? Why , under constant light intensity and constant frequency, do electrons emitted from a metal surface travel at different speeds? Photoelectric effect:- Reduction of wavelength increases current? 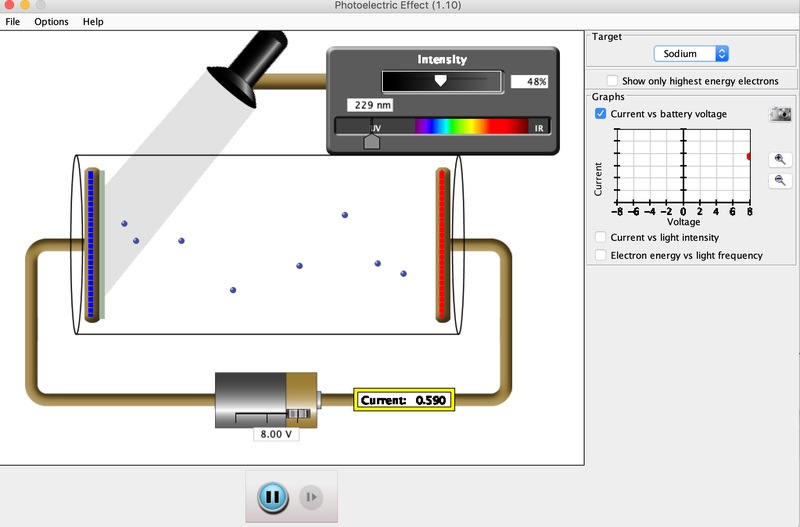 How is photo-current related to stopping voltage in the Photoelectric Effect?